I know it’s not funny, but isn’t it funny how history has a way of repeating itself? Thousands of years ago the Apostle John wrote Jesus was the Light of the world, the Christmas Light illuminated a darkened world yet the world looked elsewhere for Light. And now a couple of thousand years later because of political pressure, commercialization, and materialism the Christmas Light once again shines in a darkened world and the world looks elsewhere. 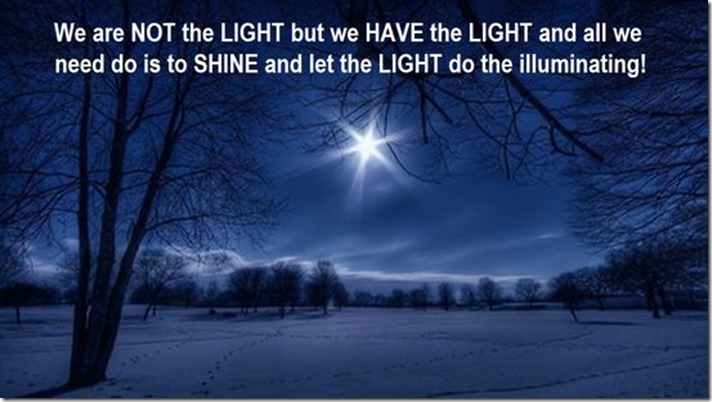 We are NOT the LIGHT but we HAVE the LIGHT and all we need do is to SHINE and let the LIGHT do the illuminating! The Giftedness of Jesus is he not only came into the world to save us who were once lost but also to forever remain in us giving us the richness of God!